' Pizza Crust...THE Pizza Crust - Sisters, What! My sister texted me the other day asking that I post about my pizza crust recipe...I thought I already had. Sorry all! I must have shared the recipe somewhere else. This is my go to meal to take to friends after they have had a baby. I love this recipe because it is easy and I can make the pizza ahead of time then take it to them and they can cook it in their own oven so it is nice and hot. This recipe goes way back...I think I got the original recipe from a friend when my husband was just starting out in Med school...that was a good ten plus years ago! This pizza recipe quickly became a family favorite and we started having pizza every Friday night. After a while I even got brave and added a bit of my own flare to the recipe. Every time we eat pizza outside the home my hubby is always quick to add, "Yours is still better!" I am not always sure about that but it really is good...enjoy! In small bowl or cup combine yeast, warm water, and sugar. Then mix and set aside. In large mixing bowl combine the rest of the ingredients. Then add yeast mixture and stir as much as possible with a spoon. Kneed the dough by hand until smooth. Roll out and layer with any toppings you wish. In the pizza pictured above I had rolled out the dough bigger then the stone and put cheese into the crust (I just used cheese sticks) then folded the extra dough around the cheese. The hubby really likes when I add the cheese to the crust. Usually the crust is not so thick. 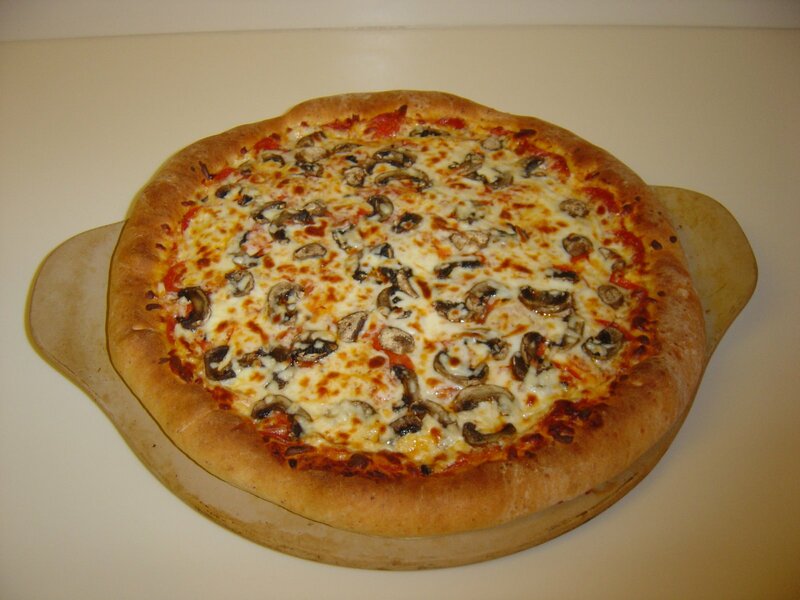 The longer you let the dough sit on the stone the more thick your crust will be. I prefer the thin crust...so I throw it into the oven fast. Bake at 425 for 13 minutes - I usually broil it for 1-2 minutes just to make it crispy on the top. You don't have to use a pizza stone but I really do think my pizza crust is a bit better when baked on a stone. Yes, it is a Pampered Chef. I love it! WOW that looks amazing! I'm pinning!! Thanks for sharing. I am always looking for a yummy pizza crust. I'm in a house with 2 little boys that love pizza!